This guide links to articles about insects that are often used in the Florida FFA Vegetable Judging Competition. Hopefully by looking at these articles (and the associated photos) you will be better prepared for the competition. Click the name above each photo to learn more. 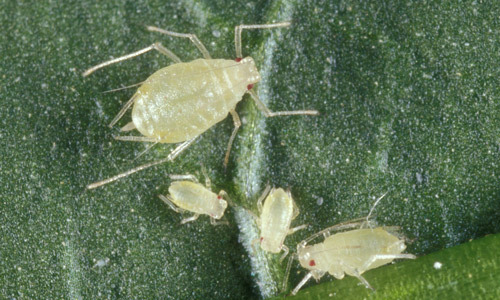 Female adult green peach aphids, Myzus persicae, with immatures. Photograph by USDA. Adult banded cucumber beetle, Diabrotica balteata. Photograph by John L. Capinera, University of Florida. 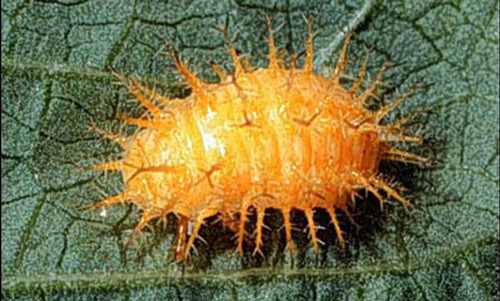 Larva of the bean leafroller, Urbanus proteus. Photograph by John L. Capinera, University of Florida. 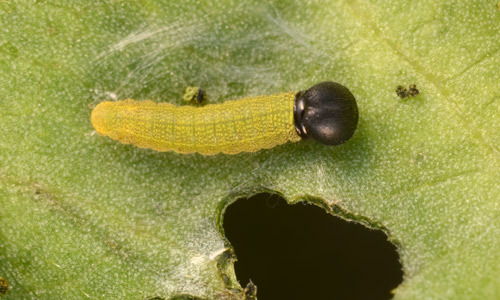 Early instar larva of the cabbage looper, Trichoplusia ni. Photograph by John L. Capinera, University of Florida. 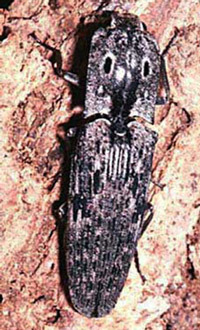 Adults of the click beetles Alaus myops, left, and Alaus oculatus, right. Photographs by M.C. Thomas, Division of Plant Industry. 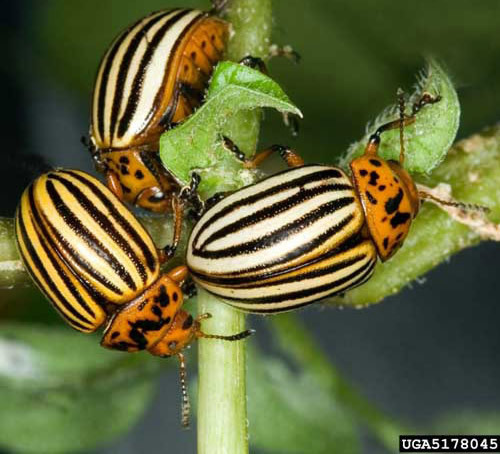 Colorado potato beetles, Leptinotarsa decemlineata, feeding on foliage. 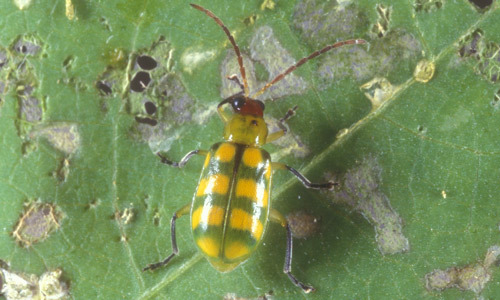 Photograph by David Cappaert, Michigan State University, www.insectimages.org. 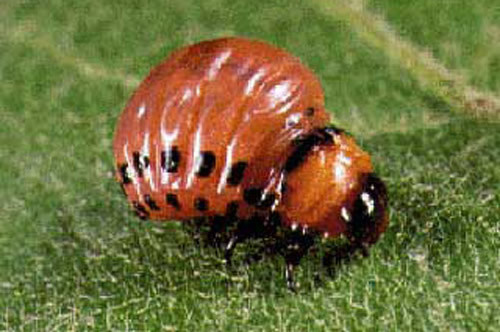 Larva of the Colorado potato beetle, Leptinotarsa decemlineata. Photograph by University of Florida. Larva of corn earworm, Helicoverpa zea, this is the light-colored or greenish form. Photograph by John L. Capinera, University of Florida. Lateral view of the larva of a black cutworm, Agrotis ipsilon. Photograph by John L. Capinera, University of Florida. Larva of fall armyworm, Spodoptera frugiperda, note light-colored inverted "Y" on front of head. Photograph by John L. Capinera, University of Florida. 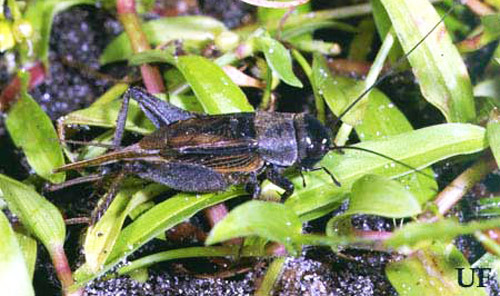 Long-winged, adult male southeastern field cricket, Gryllus rubens. Photograph by Paul M. Choate, University of Florida. 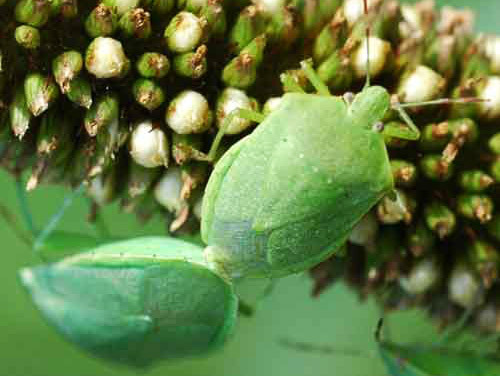 Adult green stink bugs, Chinavia halaris, on millet. Photograph by Russell F. Mizell, III, University of Florida. 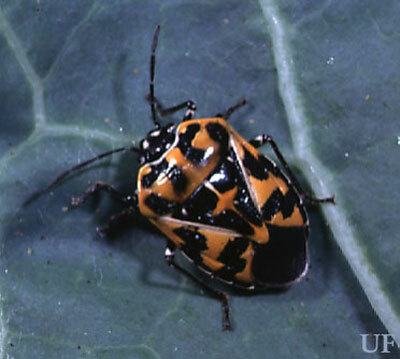 Adult harlequin bug, Murgantia histrionica. Photograph by James Castner, University of Florida. 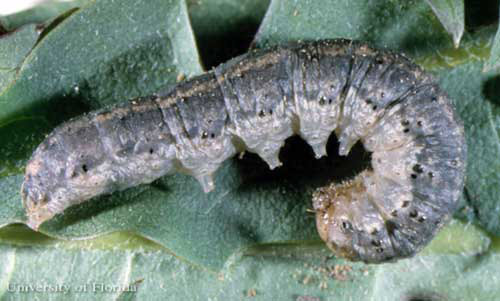 Larva of imported cabbageworm, Pieris rapae. Photograph by John L. Capinera, University of Florida. Adult green June beetle, Cotinis nitida. Photograph by John L. Capinera, University of Florida. Adult leaffooted bug, Leptoglossus phyllopus. Photograph by John L. Capinera, University of Florida. 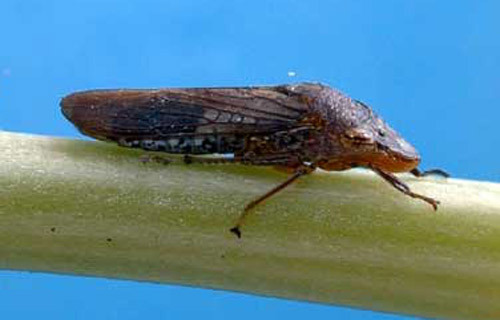 An adult Homalodisca vitripennis, the glassy-winged sharpshooter. Photograph by Chris Tipping, University of Florida. 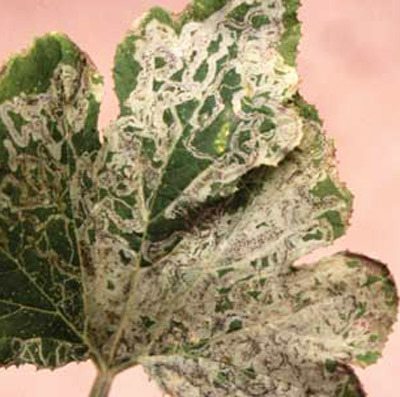 Mines in squash leaf caused by Liriomyza leafminers. Photograph by James. Castner, University of Florida. 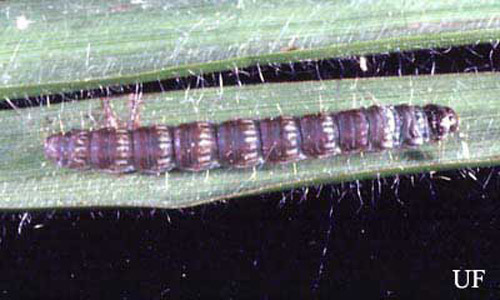 Mature larva of the lesser cornstalk borer, Elasmopalpus lignosellus. Photograph by John L. Capinera, University of Florida. 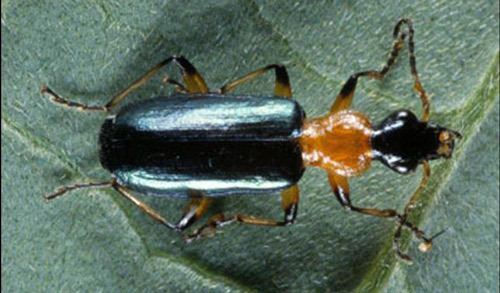 Adult Mexican bean beetle, Epilachna varivestis. Photograph by James Castner, University of Florida. 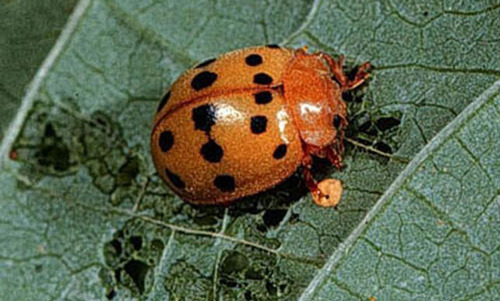 Larva of Mexican bean beetle, Epilachna varivestis. Photograph by James Castner, University of Florida. 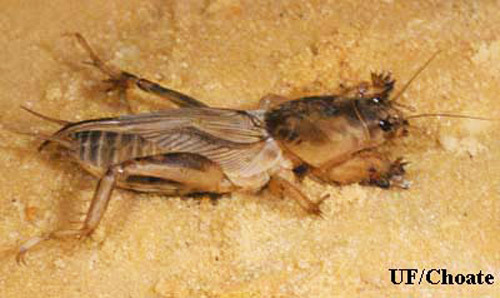 Adult tawny mole cricket, Neoscapteriscus vicinus. Photograph by Paul M. Choate, University of Florida. Young pickleworm larva, Diaphania nitidalis, on a cucumber leaf. Photograph by John L. Capinera, University of Florida. 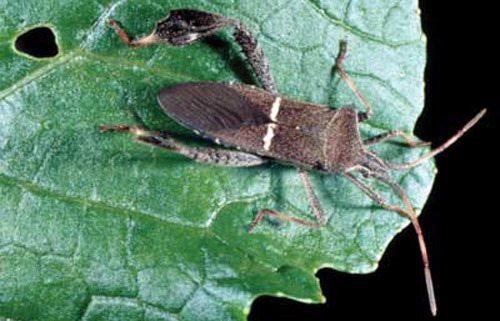 Adult (bottom) and nymph (top) of the squash bug, Anasa tristis. Photograph by John L. Capinera, University of Florida. 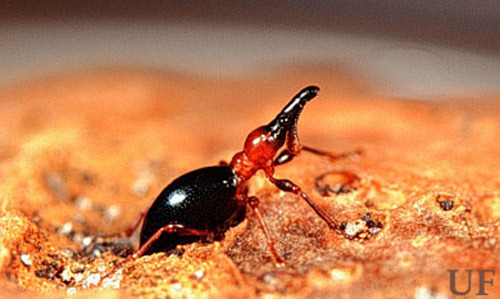 Adult sweet potato weevil, Cylas formicarius. Photograph by James Castner, University of Florida. Last instar larva of the tomato hornworm, Manduca quinquemaculata. Photograph by Paul M. Choate, University of Florida. 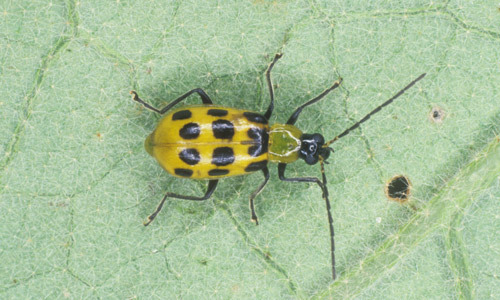 The spotted cucumber beetle, Diabrotica undecimpunctata howardi. Photograph by James Castner, University of Florida. 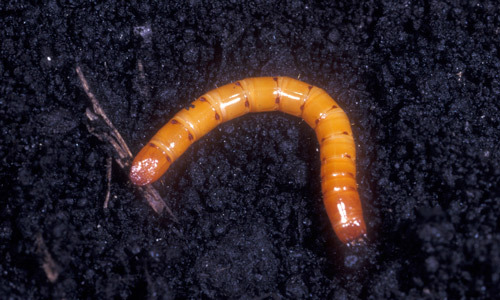 Typical white grub of the genus Phyllophaga. Photograph by John L. Capinera, University of Florida. 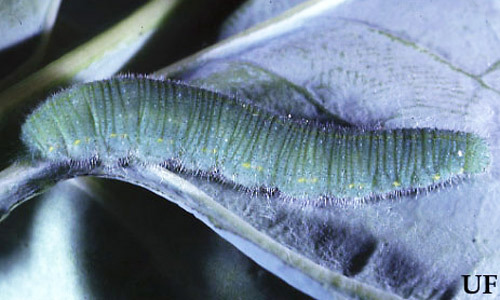 Larva of Melanotus communis. Photograph by Lyle Buss, University of Florida. 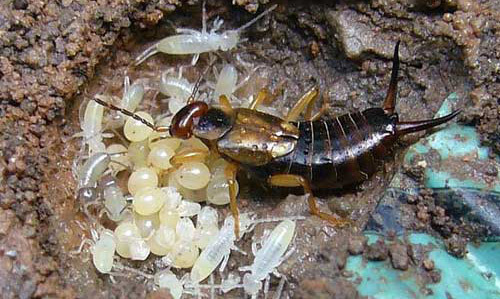 Adult female European earwig, Foricula auricularia with eggs and young. Photographed in Chester, United Kingdom. Photograph by Nabokov, en.wikipedia.org. 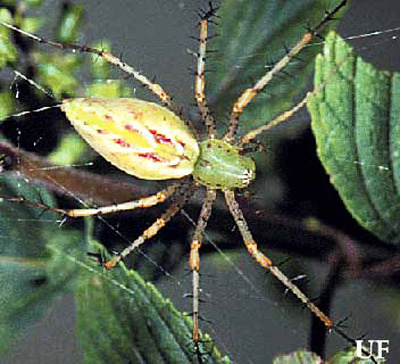 Adult green lynx spider, Peucetia viridans. Photograph by University of Florida. 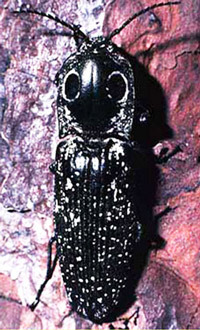 Adult Calleida decora, a ground beetle. Photograph by Lyle J. Buss, University of Florida. 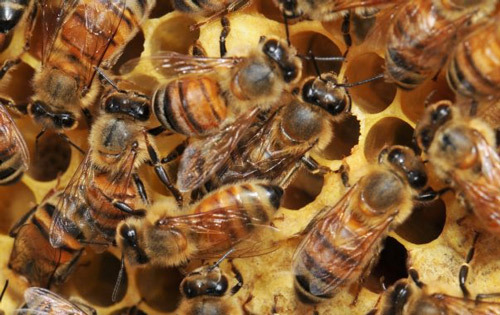 European honey bees, Apis mellifera, on comb in a colony. Photograph by Ashley N. Mortensen, University of Florida. 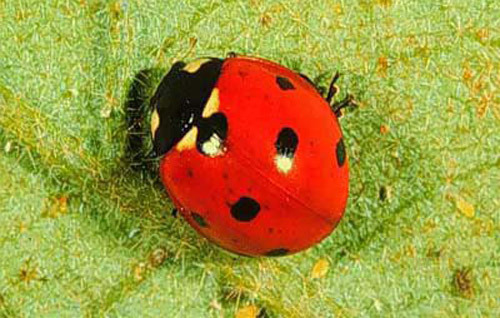 Adult Coccinella septempunctata, the sevenspotted lady beetle. Photograph by James Castner, University of Florida. 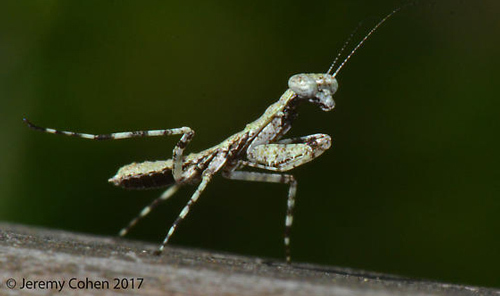 Grizzled mantid, Gonatista grisea, nymph. Photograph by Jeremy Cohen, University of South Florida. 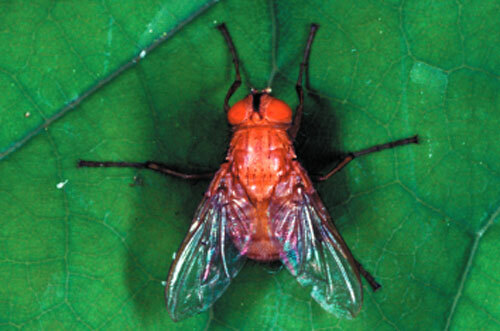 Tachnid fly, Ormia depleta, the Brazilian red-eyed fly. Photograph by Lyle J. Buss, University of Florida. 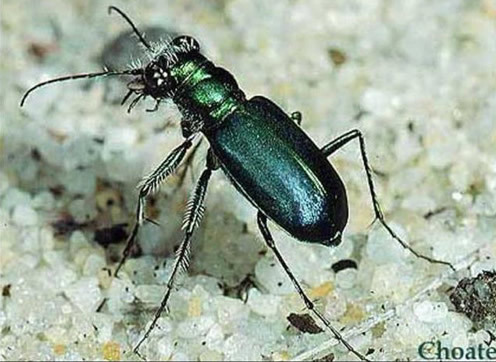 A tiger beetle, Cicindela scutellaris unicolor. Photograph by Paul M. Choate, University of Florida. * As new articles get added to the Featured Creatures database we will update links. Special thanks to the original authors of the publications linked here and to the photographers for sharing their photos. The photographers retain their rights to the images used here. Please contact them if you would like to copy or reproduce their photos. When possible an email address for a photographer has been linked to their name.